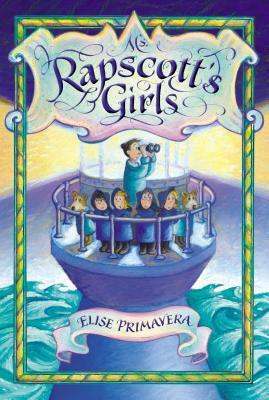 I don't read as much for early readers as I should, but I couldn't help being intrigued by the cover of Ms. Rapscott's Girls by Elise Primavera (Penguin - Dial). I found it under a pile of mess the other day--what good book doesn't live in a pile of mess, at least some of the time--and decided to flip through it. Illustrated more than many chapter books with pencil pictures, it sucked me in with its mysterious illustrations, and then with its charming text. Basically, imagine that Mary Poppins and Lemony Snicket had an optimistic child that decided to write stories when she grew up. Ms. Rapscott has a school for Girls of Busy Parents, and sends out five pre-paid boxes; parents need merely insert their children and send them away. Four of the boxes arrive with disgruntled, neglected girls; one has arrived sans girl, because her parents were too busy to close it properly. The rest of the girls find themselves at school having an adventure, and some of it is finding the missing girl, and some of it is finding themselves. There is a perfect age for this book, and that's just when you're a good enough reader to understand wordplay and have enough of an understanding of fiction vs. reality to not be frightened of the idea of your parents sending you away (possibly the same age as you'd need to be for Nancy and Plum). Some older readers have marked this out as too twee for love. I can see that, but it just skirted the border there for me, and I couldn't help giggling now and again. Maybe, too, I know enough girls with neglectful parents, and maybe I liked the idea of bossy, impervious, fearless Ms. Rapscott, and maybe I liked a flock of irrepressible, unlovable, isolated girls finding their true independence, and maybe I liked the found family aspect. Maybe. Okay, a lot. I had a couple of momentary dislikes; I thought that a couple mentions of fat people weren't nuanced, and I definitely wished for more diversity among the set of little girls (surely there are busy, distracted families with histories that can be traced to all corners of the world?). Still, because of the particular reader that I am, I was delighted on the whole, because it's so rare to find girls in a pack in books--in so many ways, we are only allowed to exist as different, only, chosen, friendless. And I think the world could use a little more sticking together.